Alpha & Omega Group specializes in civil, structural, and water resources engineering. Based on Christian values and beliefs, we conduct our work with six core values in mind: relationships, trust, teamwork, servant attitudes, stewardship, and excellence. Established in January 1998 by President Ted Bartelt, Alpha & Omega Group specializes in three main areas of engineering: structural, civil-site, and water resources. Within those areas of service, A&O is very experienced in bridge design and preservation, hydraulic assessment and design, historic preservation and site development. Since establishment, A&O is grounded in six core values: relationships, trust, teamwork, servant attitudes, stewardship, and excellence. Our tagline, ". . . Begin with the End in mind . . . ," comes from Stephen Covey's Seven Habits of Highly Effective People. We strive to understand what the end goal or outcome is in each project we undertake. More importantly, A&O operates with an eternal perspective, knowing that things of this world will perish and fade away - but those things of eternal worth will be crowning jewels forever. 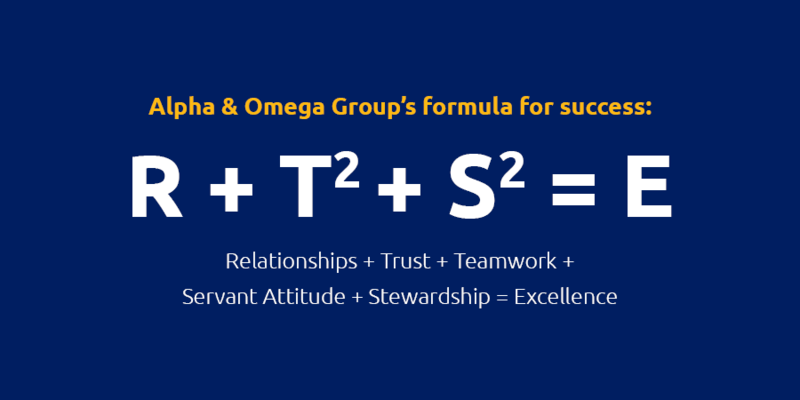 "We feel that, given our 'team' relationship, we can call upon Alpha & Omega Group at any time."